Today’s guests are Adam Jay Epstein and Andrew Jacobson, writers of the lovely and fun MG novel The Familiars. The book tells the tale of 3 familiars – magical animal companions – the cat Aldwyn, the blue jay Skylar and tree frog Gilbert and how the fate of their loyals (magical human companions) and possibly of the whole land depend on them. The novel releases in early September and is also soon to be made in a major motion picture, produced by Sam Raimi. We are delighted to have the authors here today talking about their influences and to give away two copies of the book. Without further ado, Adam and Andrew, everybody! Sometimes, you don’t realize how someone influences and changes your life until years later. 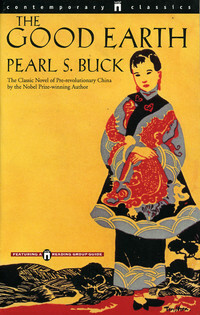 When I was in seventh grade, I had an English teacher give me an assignment to write the first ten pages of a sequel to Pearl Buck’s The Good Earth. Now, I knew very little about Chinese farmers other than what I had read in the book. But it didn’t seem to matter. Over the next few nights, I felt as if I was Wang Lung with new plights, hardships and victories. By the time I had finished the assignment, I felt as if something special had happened, as if the story had written itself. A week later, the teacher handed back the graded paper. There, on the top, was a bright red A+ from a teacher who wasn’t even keen on giving As. It was a boost of confidence, an affirmation that I could write creatively and convincingly. It felt great. Then, I went to my next class. Science. And I let the paper slip from my mind. Eight grade. Ninth grade. Tenth grade. Didn’t think about it. Then to college. Other things occupied my thoughts. It was in my junior year, when I was starting to consider being a writer,that I thought back on that paper. And her bright red A+. “I could do this,” I thought to myself. I never got to thank my 7th grade English teacher for her encouragement and that assignment. So, I will now. I grew up in the early 1980s in one of those idyllic suburban towns with only one movie theater – the kind that played the same movie for up to a year at a time. 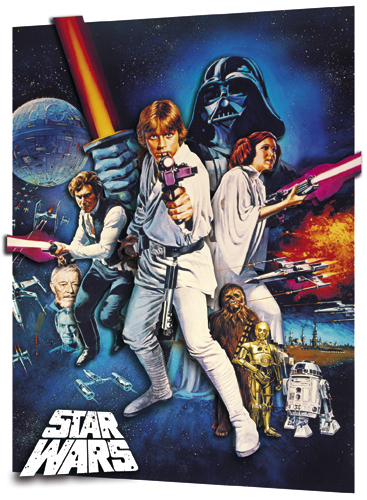 When I was just 4, that movie was “Star Wars.” It had been re-released in theaters in 1981, and it was not just the first movie I ever saw on the big screen, but the second and third and fourth, too. To further my obsession, I also collected every last action figure and vehicle from the “Star Wars” trilogy that I could get my hands on. I remember my mom even bribing me to take swimming lessons with the promise of a Boba Fett Slave 1 starship. And taking medication for chronic childhood ear aches always went down a little easier with a new x-wing fighter or Jabba the Hut palace. My favorite hobby as a kid was playing shows with my action figures. I spent countless hours in every corner of the house with a Han Solo in one hand and a Darth Vader in the other. That’s where my imagination was born, I think. Making up stories about good guys and bad guys, jedi knights and evil lords. It wasn’t just “Star Wars,” either. I had superheroes, GI Joes, and WWF wrestlers joining the living room adventures, as well. Then I started translating those epic tales to paper, in the earliest days without using quotation marks for dialogue! I guess I’ve always been drawn to hero’s journeys. Whether it’s Luke Skywalker, Frodo Baggins, Harry Potter, or Peter Parker, the possibility of even the most ordinary everyman becoming extraordinary is a timeless and irresistible tale. 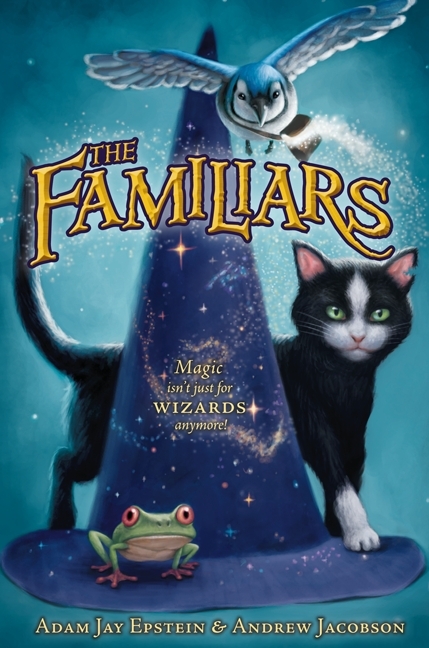 And “The Familiars” is a story not so different: about the unlikeliest of heroes rising up against insurmountable odds and finding greatness within them. 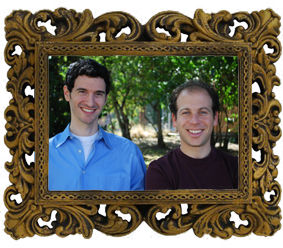 About the authors: ADAM JAY EPSTEIN spent his childhood in Great Neck, New York, while ANDREW JACOBSON grew up in Milwaukee, Wisconsin, but the two met in a parking garage out in Los Angeles. They have been writing for film and television together ever since. This is their first book. Running to save his life, Aldwyn, the street-wise orphan cat, ducks into a strange store. Moments later Jack, a young wizard-in-training, comes in to pick out his familiar – a magical animal companion. Aldwyn’s always been clever. But magical? Apparently Jack thinks so—and Aldwyn is happy to play along. Anything to get out of town! Once home with Jack in Stone Runlet, Aldwyn thinks that he’s got it made—a life of ease with a boy who loves him. He just has to convince the other familiars—the know-it-all blue jay Skylar and the friendly tree frog Gilbert–that he’s the telekinetic cat he claims to be. Then, after the sky lights up with an omen, the unthinkable happens. Jack and the other young wizards are captured by the evil queen of Vastia. Together Aldwyn, Skylar and Gilbert must save them—but how? On their thrilling quest across the land, the familiars will face dangerous foes, unearth a shocking centuries old secret, and discover a mysterious destiny that will change them all forever. You can read more about the book at the website The Familiars. We have TWO ARCs (Advanced Reading Copies) of The Familiars up for grabs. The contest is open to ALL, and will run until Saturday, August 21st at 11:59 PM (PST). To enter, simply leave a comment here letting us know which animal would you pick as a familiar. ONLY ONE ENTRY PER PERSON, PLEASE! Multiple comments will be disqualified. We will announce the winners in our Sunday stash. Good luck! Judged by the cover (which is squeeing cute, by the way), I would pick a frog like that. Someone who’s got such curious looking eyes must be a born familiar. Great contest, ladies, and the book sounds great, gentlemen. I’m allergic to cats so I’d have to say my choice for a familiar would be a dog. Kinda boring, huh? I love kitties, so I would definitely will have to pick the traditional kitty cat. I would like a fluffy black or a black/white kitty (like two cats that I have had in my life who would be perfect for the role). Or, if I want to break out of that, a silver panther would be cool too. It looks adorable! I would pick a black-capped chickadee for a familiar: small enough for a pocket, able to get in and out of tight places, and cute to boot. Since I too am allergic to cats, I will pick a pocket Dragon. If that is currently unavailable, than a Wolf. Looks like a good book, I would have to choose a bird of some sort, maybe a parrot with beautiful colours. I would have to pick a cat. Boring, but I love them! I would choose a gecko. I think they are so cool hanging around all over the place. It would also make them excellent at spying. Also he would be small enough that I could slip him in my pocket if necessary. I would choose a cat to be my familiar, OF COURSE (help, my cat is forcing me to write this!)! My familiar would be a meerkat—I don’t know why, I just like them! Would love to get this book! And my familiar would be a tiger cause it’s a big cat but it also doubles as protection. I would pick a Pygmy Three-toed Sloth. No one would ever expect me to be a familiar, thus, I would get away with all kinds of Mayhem. Oh me me! I’ve been wanting to get my hands on this one LOL! I would have to say that I would go with the oh so-not-suprising cat….I have two cats and one loves me more so hmmm? Yep, Cat. Thanks for the great interview and giveaway! Great contest! As soon as I heard about this book, I knew it was gonna be good. Magic, danger, and some friendly familiars to guide readers on their way. Can’t wait! As for my familiar, if going with one in the book, the cat for certain…if not, definitely a dog. Grant it, not that imaginative, but definitely a great fit…loyal, friendly, trustworthy…and cute. 3) I could still ride it. After some things…I’d probably trade it in for a cat. But until then – UNICORN. Ring-tailed lemur. No question. I’ve loved them my entire life, since a wildlife man came to my school when I was seven and put a little one on my shoulder. It pulled my hair and I fell in love and there’s no other animal I’d consider. And here’s to English teachers who inspire us – I will never forget Richard, who encouraged my obsession with the most random of literature and didn’t question my decision to write essays in the most abstract way possible. I think I’d choose a hedgehog because they’re extremely cute but can turn into a ball of nastiness when scared or provoked. I’d have to go with an adorable tiny white cat. Going to go with cat, since we just added two more to the household. In fact, Calder is a tuxedo, just like the cover. But I would have to give serious consideration to otters, for those water skills, bats for the sonar bonus, and red pandas for the unbearable cuteness. And if I can choose extinct critters then I’d like a thylacine or a five-foot-tall Peruvian penguin. I’d want a Tokay geckos because they are orange and blue and bite. do unicorns count as animals? My familiar would be some form of feline. I am a Leo and a Tiger so a feline makes sense. Yeah, definitely a cat. Or…a ferret. I really like ferrets 😀 And they’re so twiney! I would want my familiar to be a cat. He/She would be my adorable familiar. I would really like that. My favorite animal is dolphins so that would be my choice! I would pick a dog as my familiar. This book sounds excellent! I’m a fan of frogs, so that’d be my pick for a familiar. My familiar would be the wise owl! The book sounds like a great fun read! something that flies I think, although I’d like furry too…a bat! I would pick a wolf! Oh a white owl would be cool. Or a snake so it can hide in my jacket or just hangout around my neck. Plus he can slither through tight spaces, that’ll come in handy. I would like to have a Siberian tiger for a familiar! I sure hope I win! Thanks! I’ve never heard of a lion being familiar but it would be so cool if it would be possible. I think lions are the most beautiful creatures so I would choose one to be my familiar. I would be a hummingbird – I just finished reading another great book w/ my 11 yr old – “The Underneath” so those animals are fresh in mind. A dragon! No really, a panther. Yah that’s it! An owl, I think. While she wasn’t a familiar, how cool was Hedwig in Harry Potter? A cat, I think, since we could get along when not being magical. 😀 While frogs are awesome, I’ve never gotten along too well with them after protracted exposure. OH OR A TINY BABY DRAGON. So long as I could have some fireproof ointment. An owl, for sure. They are my favorite birds and are super intriguing to me. I definitely believe that they are wise and have powers. I’d like a gecko for my familiar! There are small and cute and therefor easily underestimated. They could prove a very useful weapon! Thank you for this event! My familiar would be a cat of course! I’d either want something small like a frog or a monkey or something strong, lithe, and lethal like a panther. At the moment, I’m leaning towards a panther. Probably because my obnoxiously large black cat is waddling his way towards me (sadly, not a panther. Just a kitty whose been hitting the chow pretty hard as of late and moving a lot less. So not lithe and lethal). Or maybe a baby dragon like Kit from Tamora Pierce’s Immortal series? Drat, I’ll never make up my mind at this rate. My familiar would be a fox. I will pick a (unoriginal) wolf! I’ve been wanting a familiar a long time (:P) but its been a wolf ever since I played Torchlight game last year. Love the wolf in that! I would go with the classic, a cat. I would want a ferret as a famaliar! Thanks for the giveaway! Even though it may seem like the obvious choice, I would have to choose my favorite animal – the cat! I am a traditionalist so I would pick a cat as my familiar. The book sounds like a lot of fun so please enter me in the giveaway. Thanks for opening it up to worldwide entries. Maybe a hawk? Although I love dogs, I’d like a familiar who can fly and check out surrounding areas from up high. Of course, I hope I wouldn’t have to get a special license to have a hawk around. I would chose a white bengal tiger, because they’re so unique and exotic and cool. Also they could protect me and give me a speedy ride with my hair flying back. I would choose the tiger just because its like a cat but a big one. what a fantastic animal. Oh, I think that I’d have to go for a raven, because they’re smart as it is. A chipmunk…as long as it can sing and dance. A monkey a la Curious George! My younger brother loves the show, so when I watch it with me, I’m often thinking about how cool it’d be to have a monkey like George following me around all day and making me laugh. I’m a complete dog person so it has to be some kind of dog, or maybe a wolf. Definately a member of the Canidae family! I’d love to enter!! I’d pick a cat! !